I tend to make lists of things, books, songs and movies to keep a precarious order in my mind. Your top 5 romantic movies, for example. Easy as drinking a glass of water: Pretty Woman, Nottingh Hill, Dirty Dancing, Sleepless in Seattle and Four weddings and a funeral. 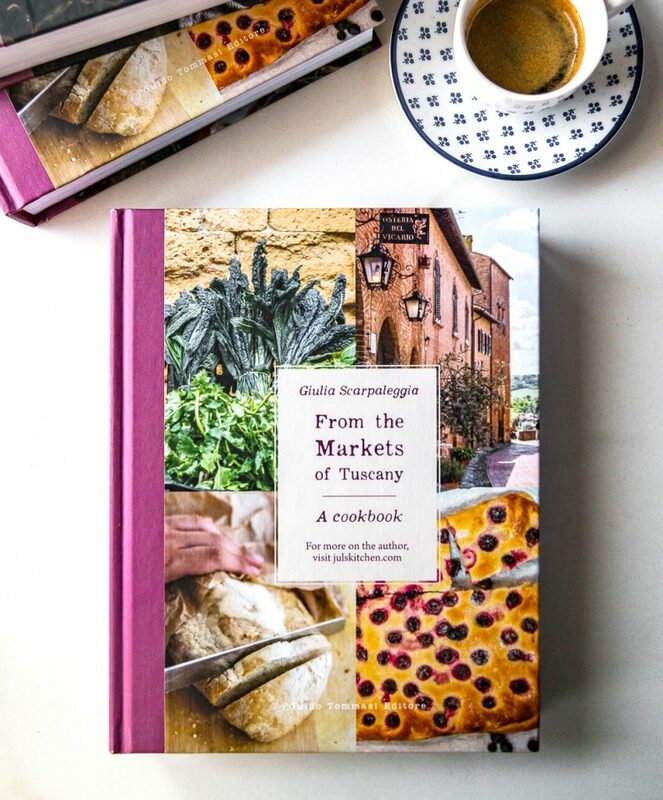 I did the same with the books that inspired me to become a food blogger and turn my passion into an every day challenging and exciting job made of cooking classes, recipe developing and food writing. Elizabeth David, South Wind through the Kitchen – a collection of writings of the food writer I admire the most, whose style brings the smell of freshly baked bread in your kitchen. Sensuous food writing, precise and intense words, vivid images, succulent recipes: there’s everything I would wish to a food writer! Hélène Dujardin, Plate to pixel, the Bible of the food photography for a blog, where you can find tips and tricks, a colour wheel to help enhance your composition, beautiful photos to inspire you and a crystal clear explanation of natural and artificial light. Dianne Jacob, Will write for food, everything you always wanted to know about food writing but never dared ask. Seriously, I studied the book as I used to do at University, with bookmarks, highlighter and pencil, marking almost every paragraph with an exclamation mark. I remember telling my best friend I was excited, everything seemed to fall into its right place, writing, photography, social media, blogging. It helped me creating a mental map to refer to every time I needed guidance and inspiration. You can imagine my excitement when I read that Dianne Jacob was going to speak at the Food Blogger Connect 2012, in London. I attended the FBC conferences in 2010 and 2011, they were the events that most gave me self confidence in my newly born career, not to mention the new friends I met there, some of them are among my best friends now. As soon as I realized I was going to meet Dianne in September, I decided to write a list of questions I would have asked her in London, once I had managed to find a bit of courage and definitely more fluency in spoken English, enough not to stumble on every word for the emotion – have I ever mentioned how shy I am when I have to speak in public? Soon I realized I could write her – wasn’t it the best way to express myself without blushing more and more at every single word? So I took my pen and notebook – you know how old-fashioned I am – and wrote down a few questions I would have asked her, something that might be interesting for you too, I thought. Then I typed everything into an e-mail, trying to avoid as many grammatical mistakes as possible, and not without blushing for the emotion I sent the e-mail. After a few hours, precise and punctual as I would have expected from her, I got these answers and a very kind e-mail… I’m already counting down the days to the London Food Blogger Connect, aren’t you? Juls – Writing a post once, twice, three times a week, answering comments, leaving comments on other interesting blogs. What if I do not have time to do all these things properly? Is there a priority to behave as a good foodblogger? Is food Blogging too much work? Regarding commenting on other people’s blogs, someone once told me that a blogger comments on her blog and several others by cutting and pasting a comment into each. As you might imagine, no one is impressed. To do it right, you need to write a comment that is so fascinating, readers will click on your name to find out who you are. No pressure. Juls – I discovered Elizabeth David reading your book and she became my idol and obsession. If you had to name just another excellent food writer to read, who would you suggest and why? Dianne – Oh that’s interesting! I don’t blame you. You have lots of company. I hate to sound obvious, but have you read Julia Child? She is delightful, even if you’re reading recipes. She’s down-to-earth, funny, obsessive, fun, and very sharp. And I would like to add Kim Sunee. Right now I am reading Trail of Crumbs and drowning in its sensuality. Find her books here. Juls – I am an Italian foodblogger aiming to become an international food writer, and there are many others out there sharing my dream. How to deal with an English that has a vivid Italian mark? Could this be considered a trademark or should we work to hide it? Dianne – Regarding the “Italianness” of your writing, I say go for it! Do not lose it or try to flatten it out. It’s part of why people come to your blog, and what gives your writing a unique voice. Juls – As Italians we write our recipes using the metric unit of measurement, but sometimes American readers ask me to translate the ingredient list into cups. If we aim to write for an international audience, should we translate the ingredients or is it enough to suggest a reliable on line convertor? Juls- Since we’re going to meet soon in London for the Food Blogger Conference, why would you suggest to take part to events like this? Dianne – Food blogging can be a solitary passion. Even where I live, in the San Francisco Bay Area, there are few meet-ups and events. It’s fun to get together at a conference, share stories and resources, take photos, use social media, eat together, and learn together. The camaraderie is thrilling. Plus, you make friendships that continue for a long time after the conference. I have made some lasting friendships as a result of attending conferences. Juls – Last question. This is more an advice for future food writers and your opinion on the discussion arisen by what Amanda Hesser said in Advice for Future Food Writers. How important is to get out and dirt our hands? Is it a dream or can we still hope to become paid food writer? Maybe the truth lies just in the middle? Dianne – If you mean gardening, if you’re interested in that aspect of food production, then go for it. It’s exciting to grow produce and cook it. Is it essential to food writing? No. Regarding becoming a paid food writer, I don’t know how it works in Italy, but there are very few full-time paid food writing positions in the US. Most food writers do so as a hobby. Some have managed to eek out a small living, and fewer still make an excellent living. If you want to write full-time, it will probably be as a self-employed person. Is food writing a dismal way to make a living? Being it a foodblog, I couldn’t avoid posting a recipe. I decided to thank Dianne with a recipe she somehow helped me to discover: during these first hot summer days nothing could be better than this refreshing cantaloupe stuffed with damson plums, inspired by Elizabeth David (from the book At Elizabeth David’s Table – Photo by Sir David Loftus… should I say more?). She suggests to stuff the cantaloupe with strawberries, I decided to use a generous handful of ripe damson plums, bought in the morning at the farmer market. To gloss the fruit, I made for the first time some home-made gelatine, following the recipe I learned during my pastry class. The gelatine can be made in advance and kept in the fridge for several weeks, closed in a glass jar. Make it in a generous quantity and use just a few tablespoons in this recipe, you’ll discover how useful it is to have some ready home-made gelatine in the fridge! Add 350 g of sugar, the glucose and the lemon juice in a small pot, cover with 400 g of water and stir to mix. Heat until it reaches 75°C. Mix the pectin and 50 g of sugar in a small bowl, then add them to the hot mixture and stir energetically with a whisk to avoid lumps. Let it cook until it reaches 101°C, then remove from the heat. Let it cool down before using it. 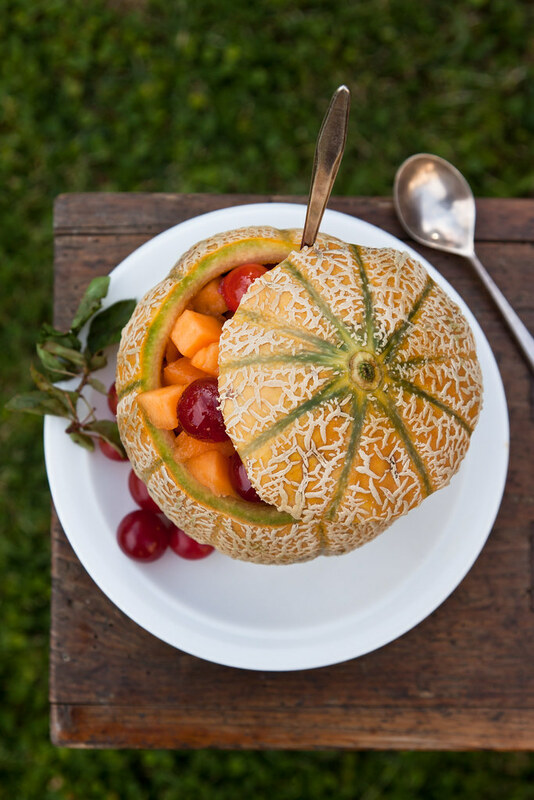 Cut a slice off the thick end of a melon and keep it aside. Remove the seeds and scoop the flesh, then cut it into cubes, put in a bowl and mix with a generous handful of ripe damson plums. Add the sugar and the mead, then add a few tablespoons of the slightly cooled down gelatine and stir to evenly distribute it. 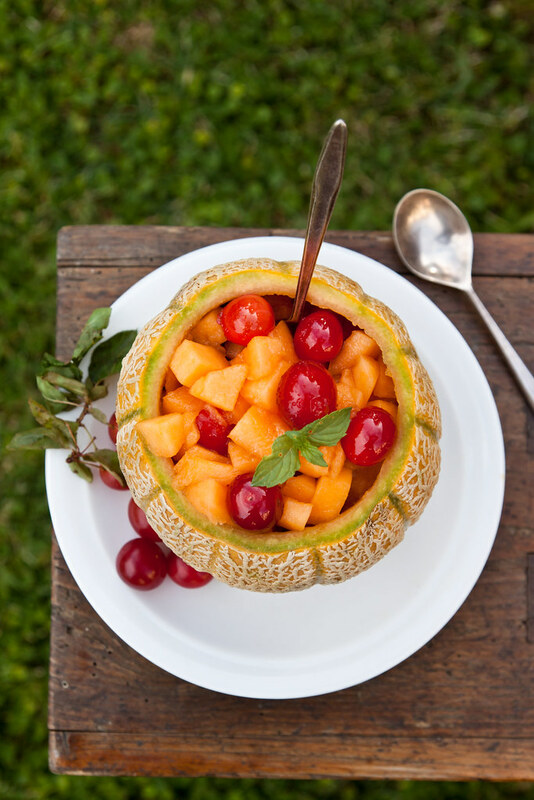 Return the fruit into the melon and decorate with fresh mint leaves. Keep it in a cool place before serving it. So, I am curious now, how do you feel? Why this question? Well, it’s easy said: every time I make an Elizabeth David’s recipe, read one of her pieces on French peasant cooking or learn something new from Dianne’s thoughtful posts, I feel inspired, excited, hungry for more. I hope I have passed on some of the passion they constantly give me for my favourite obsession! Check the Food Blogger Connect website for more information on program and speakers. I’ll be there! A lovely interview! Thanks for sharing. That salad looks so refreshing and delicious. Thank you Rosa, I am glad you like the interview and the fruit salad! I’m a fan of Dianne Jacob’s book too. We share some fav books and movies as well. I can’t wait to be in London with Dianne and you. Comments for me are an important part of communicate with other bloggers. Comments should be spontaneous and sincere. So strict rule on the number of comments to write as some big blogger suggest. About the opportunity to making a living with blog…how many big hopes I have. I love writing since childhood. Writing about food is somehow writing about people and their emotions. Thanks to Dianne I fall in love of MFK Fisher: I adore her. you know so much about bread, and beer, and natural yeast.. it’s a pleasure to read your posts, spontaneous yet very informative! And thanks to you I love MFK Fisher, too! This was a wonderful post, the interview was really fascinating and inspiring. 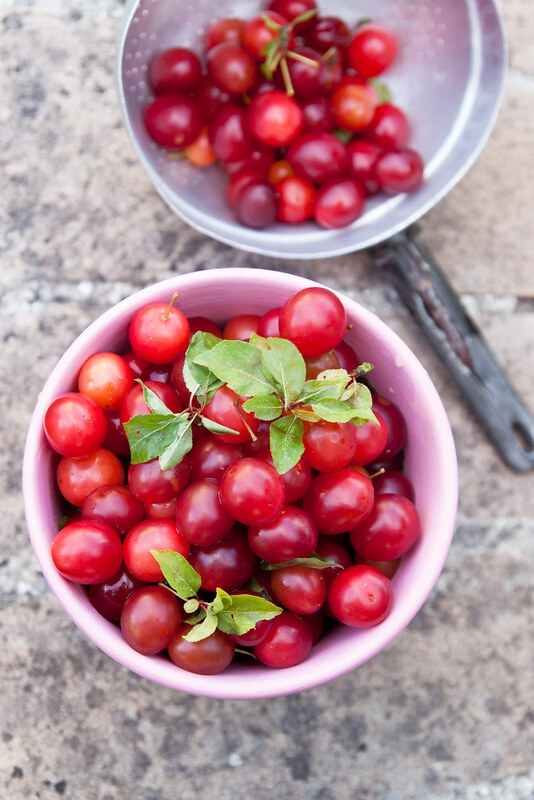 Oh, and those damson plums are just achingly cute, now I need to go and find some— fast! cute, the right word that came into my mind when I saw them, cute, sweet, juicy and delicious! You’ve done a lovely job with this post, Giulia, and the photos are gorgeous. South Wind in the Kitchen is one of my favorite food books too. And I have been a fan of Helene for years. I can’t wait to meet everyone in London in September. I hear from European bloggers on my blog, but rarely get to meet them. I hope you won’t be too shy to say hello. Thank you Dianne for this great opportunity. I will say hello for sure, you’ll recognize me, I’ll have your book with me! I was thrilled when I heard that Dianne Jacob would be at FCB 12 – her voice is pragmatic, open and honest – a quality that is so valuable in advice (and equally in a friend). Elizabeth David’s writing is timeless and knowledgeable and a huge source of inspiration. I’ve booked in for the workshop and this is a lovely taster. It’ll be great to meet up with you again too Guilia. PS the fruit looks divine. Yes, can’t wait to mett you again, and this year we’ll make sure to talk a little more right from the beginning! Thank you for the buzz! Excellent interview. I’m buying Jacob’s book right now! Interesting recipe too. 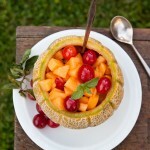 I never thought of combining melon with plums but it sounds really refreshing and tasty. Could I use hypocras instead of mead? Holly, you’ll love it, I’m sure! I’ve never tasted hypocras, but as long as it is sweet, it is a perfect combination, you can play with ingredients to make it your own perfect salad! I didn’t have time to read your post before our holiday. Although I wanted to be updated with everyone’s new blogposts I didn’t manage to do it. Thanks for sharing this interview. I didn’t know too much about Dianne Jacob but you made me curious. I didn’t plan to attend her workshop at FBC (because of financial problems) but I might change my mind and I try to save more money just to pay for another workshop at the conference. I’m catching up with everyone’s blog posts, too! Thanks Giulia! I just purchased Dianne’s book by your recommendation and look forward to reading it! well done Christine! you’ll love it!